Artist Zach Lieberman transforms Hadrian's Wall, which stretches along the English countryside, into an innovative communication device. The project, called Connecting Light, was designed to subvert the traditional role of walls and borders in society -- instead of keeping people apart, the wall became a communication device designed to bring people together. 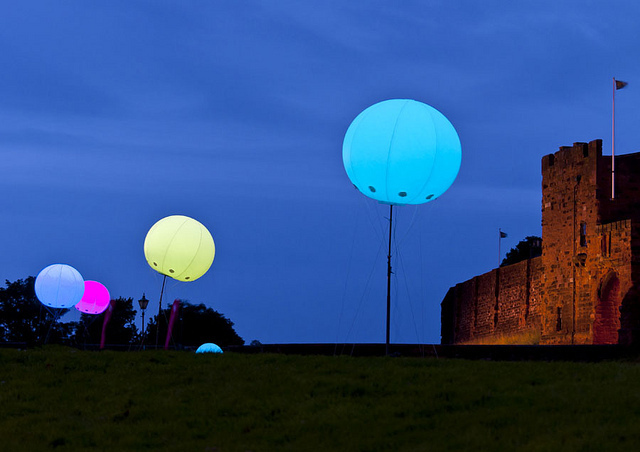 Using a mobile application or the Connecting Light website, audiences were able to submit text messages that were converted into audio wav files and interpreted as a combination of pulsating light and color that travelled the length of the wall, from one balloon to the next, to the surprise and delight of unsuspecting cows and local residents. Hadrian’s Wall is a historic relic of the Roman Empire in Britain. Connecting Light lights up the facade of an old stone castle. Artist Zach Lieberman is one of the key masterminds behind YesYesNo, and an essential figure in the community of artists working at the forefront of media and technology. As one of the founders of openFrameworks, a C++ coding toolkit and global creative community, Lieberman is considered something of a sensei when it comes to media art. He makes projects that continually locate the human in technology, focusing on gesture and storytelling and bringing elements of play, performance, and magic (in fact, he’s even worked with a magician) to today’s most cutting-edge tech tools. In our behind-the-scenes video above, we spoke with Lieberman about some of his favorite past projects and the themes that drive his work. We also followed him to the UK for the debut of Connecting Light, his most ambitious undertaking of his career thus far. Testing the installation in New York City. Demo on the streets in New York City.